EUPHA is dedicated to letting the voice of public health professionals be heard in Europe. Join us in our efforts by contacting us. Please find below our latest activities to influence public health policy at European and national level. Please feel free to distribute and support. EUPHA publishes e-collection 'Fighting antimicrobial resistance: actions taken across Europe'.Antimicrobial resistance (AMR) will remain one of the key threats to global health in the years and decades to come. It is already costing thousands of lives every year. The European region is not spared and unless AMR is tackled rapidly, it will likely become one of the top causes of deaths, globally and in Europe. The European Journal of Public Health papers in this e-collection provide concrete examples of how the strategic objectives of the AMR global action plan can be operationalised in the region, showcasing some successes but also highlighting some of the challenges, in particular around changing prescribing and consumption behaviour. The e-collection can be accessed here. Our colleagues from Romania have kindly translated the e-collection. You can find the translation here. The European Public Health Association (EUPHA) strongly supports the statement issued by the World Federation of Public Health Associations and many other like minded partners regarding the attempt made by the Philip Morris funded “Foundation for a Smoke-Free World” to interfere with global health policy and decision-making. EUPHA has consistently voiced its concern about the tactics being used by the tobacco industry and has issued several statements to this effect over the past months (16 March 2018, 27 March 2018, 30 August 2018). In support of the statement issued by the FCTC secretariat on the launch of the Foundation for a Smoke-Free World, EUPHA reiterates that no government or organisation should accept money from, endorse, or enter into partnerships with the Philip Morris International (PMI) funded ‘Foundation for a Smoke-Free World’. The damage being wrought world wide by the continuing global tobacco epidemic requires us to work even hard that ever before to ensure the full implementation of the FCTC. EUPHA highlights its stance on not endorsing research conducting or funded through any partnership related to this PMI-funded Foundation. The European Public Health Association (EUPHA) welcomes the adoption of a recommendation on strengthened cooperation against vaccine-preventable diseases by Health Ministers during the EPSCO Council meeting held on Friday 7 December. By adopting this recommendation, Ministers send out a clear message on the importance of maintaining high levels of coverage within the European Union. They also demonstrate the importance of continuing cooperation at European level to effectively address cross-border health threats. During the past months EUPHA has worked to raise attention on the importance of increasing vaccine confidence by publishing a special e-collection of articles published in the European Journal of Public Health and organising a symposium with national and European experts and stakeholders. EUPHA calls upon politicians to show their support for vaccination since this is important for building vaccine confidence in European citizens. EUPHA and the Slovenian National Institute of Public health are joined by 17 national associations of public health and 8 institutional/individual supporters in the Ljubljana statement calling for political engagement to reduce inequalities in health. The Ljubljana statement is published on the opening day of the 11th European Public Health Conference, organised in Ljubljana, Slovenia, from 28 November - 1 December, where we are expecting over 1'600 participants. The public health community reiterated the principles set out in the Alma Ata Declaration, Ottawa Charter, Tallin Charter and Vienna Declaration, and remains determined to accelerate activities in society, and in this way influence the health of the present and future generations of Europeans more effectively. The public health community is aware of its responsibility for supporting politicians and decision makers, to empower them so that they will act in accordance with the needs of society. Action is needed to reduce the burden of disease and combat inequalities in health. The statement has been updated on 21 January 2019. On Wednesday 7 November 2018, EUPHA organised a Vaccine confidence seminar in Brussels. With around 40 active participants, the seminar can be seen as a success. The full report of the seminar is available here. Together with ECDC, EUPHA is planning to follow-up on this seminar early next year. EUPHA just sent a reaction to a a letter addressed to the Hong Kong Special Administration earlier this year which argued against what was then a proposal by the government of Hong Kong to ban sales of e-cigarettes. The European Public Health Association (EUPHA) has recently updated its assessment of this evidence and, in the light of what is now known, strongly supports the precautionary approach towards e-cigarettes. Hong Kong's recent decision to ban sales of these products has been applauded internationally and we urge you to uphold this health promoting policy decision. The Austrian Presidency organised an important conference which sought to raise awareness of the relevance of public funding for innovation in the health sector in Vienna on the 25 September. Dr Natasha Azzopardi-Muscat, represented EUPHA as a guest speaker on the topic of identifying and effectively tackling medical need in research programmes. 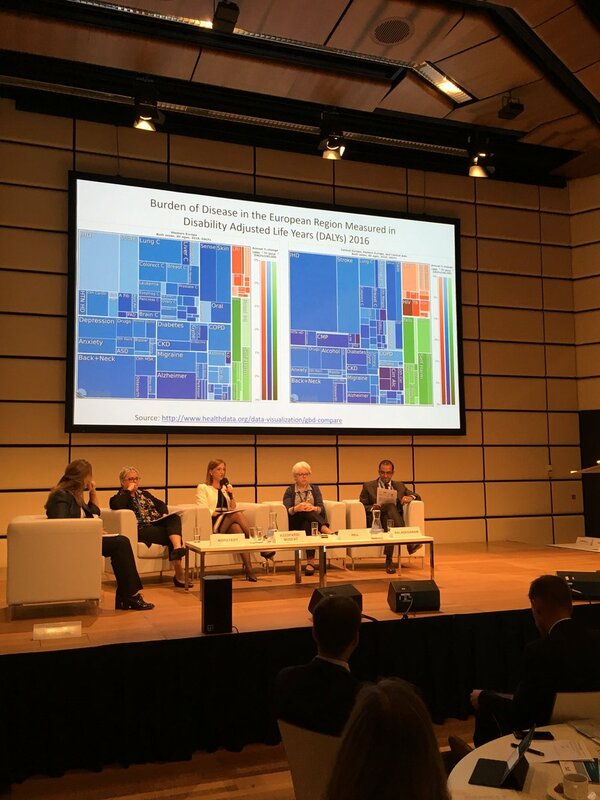 Natasha outlined the public health approach to measuring disease burden in the European population using DALYs and identifying the mismatch between disease burden, expected increase in disease prevalence and gaps in pipeline medicines. She highlighted the need to ensure that areas such as central nervous system and mental health are not sidelined in view of their disease burden. She also questioned whether a utilitarian approach however is sufficient in the SDG era which focuses on ‘leaving nobody behind’ and therefore rare diseases should also have their specific pipelines and investment. Nonetheless, she cautioned against ‘orphanisation’ becoming the modus operandi for the bullk of pharm R&D since this would surely be unsustainable. She also explained how projects such as To-REACH which is dedicated to setting a strategic agenda for health systems research in the European Union by bringing several stakeholders together could be replicated in this area. Finally, the EUPHA President called for a wide consultation on an explicit health research strategy for the forthcoming funding period and reminded participants that many health needs arising from common diseases can be prevented and avoided in the first place by focussing upstream and implementing healthy public policy. The 68th session of the WHO Regional Committee for Europe took place 17-20 September 2018 in Rome. One important agenda point was the European Vaccine Action Plan. EUPHA expressed its concern at falling confidence in vaccinations to the Regional Committee. EUPHA and its members highlighted the importance of political support and leadership for vaccination. Achieving a better understanding of political processes and the role they play in determining stances on vaccination policy, is an important avenue to help us communicate and better address genuine concerns as well as tackling organised purveyors of fake news. Further reflections by EUPHA and European Forum of National Nursing and Midwifery Associations (EFNNMA) can be read in our joint statement on the European Vaccine Action Plan. Another important agenda point at the 68th WHO Regional Committee for Europe was the advancing public health for sustainable development in the WHO European Region. EUPHA and 15 co-signatories called for investing in public health, not forgetting about mental health, and the need for multisectoral approaches. The progress report on the ‘Action Plan to Strengthen the Use of Evidence, Information and Research for Policy-Making in the WHO European Region’ provides an overview of the implementation progress of the four action areas. EUPHA and its members expressed support for this Action Plan to strengthen the use of evidence. We see that this action plan can contribute to reducing health inequalities and improve the health status and well-being of individuals and populations within the European region. EUPHA and its members support the WHO Regional Office for Europe in leading this evidence-informed policy-making. We stress that scientific evidence should remain a key input to policy making in a ‘post truth’ world. In addition, we should also assemble evidence on the politics of decision making, as this will strengthen the position to advocate for health. In November 2018, EUPHA will support the publication of a supplement to the European Journal of Public Health on political landscapes and policies for public health. Given the available evidence, EUPHA strongly supports the precautionary approach taken in the EU Tobacco Products Directive and in statements by WHO. It is not possible, at this point, to make any claims about the relative safety of e-cigs compared to traditional cigarettes. The overall effect may well be to worsen the tobacco epidemic first by deflecting smokers from using proven smoking cessation strategies and shifting them to e-cigs, which, for most smokers, reduce successful smoking cessation, and second by deflecting discussion from measures opposed by the tobacco industry. E-cigarettes are expanding the nicotine market by attracting youth who were at low risk of initiating nicotine use with conventional cigarettes, but many of whom are now moving on to those conventional cigarettes. Even if they do not progress, promoting nicotine use to youth is bad public health policy. EUPHA responded to the public consultation on excise duties applied to manufactured tobacco and the possible taxation of novel products. In the response the importance of public health is highlighted and the need to discourage the use of tobacco and novel products such as e-cigarettes and heated tobacco products, including vaping and juuling. We invite our partners and members to also respond the this consultation. The Austrian Public Health Association (ÖGPH) held their annual conference 23 and 24 May 2018 in Vienna, Austria. The theme this year was 'Health in all Societies'. In the afternoon of the first conference day, EUPHA president, Natasha Azzopardi Muscat, presented the European perspective on public health. On May 2nd, 2018, Jean-Claude Juncker, President of the European Commission, presented the proposal for the post-2020 European Union (EU) budget. We believe that European funding for (public) health remains as important as ever and are convinced that it has significant added value. Reflecting on the published proposal, we are pleased to see that the Health Programme will at least be partially continued, even if we are disappointed that the word ‘health’ is almost absent throughout the budget proposal. Read our statement for more reflections on the post-2020 budget proposal. The EUPHA statement on migration, ethnicity and health is published concurrently with the 1st World Congress on Migration, Ethnicity, Race and Health that is held this week, 17-19 May 2018, in Edinburgh. Migrants and ethnic minorities (MEM) often face serious inequities concerning both their state of health and their access to good quality health services. These inequities are increasingly being brought to light by public health researchers, but action to tackle them has lagged behind. To ensure that adequate attention is paid to the determinants of MEM health and the problems of service delivery that can confront these groups, health systems need to become more inclusive. The statement in Portuguese can be found here. EUPHA is a co-signatory of the Report stage briefing on Brexit, set up by the UK Faculty of Public Health. The UK Faculty of Public Health has proposed a ‘Do No Harm’ amendment to the Report on the EU (withdrawal) Bill, as they want to ensure that the UK continues to be bound by article 169 of the Lisbon Treaty, which reads “a high level of human health protection shall be ensured in the definition and implementation of all EU policies”. The ‘Do No Harm’ amendment has been signed by over 40 national organisations and two European organisations. ´The health of the public must remain of paramount importance to this and all future governments – maintaining and improving the public’s health, alongside protecting our nation and our economy must surely be the most important duties of any government.´ This Bill is where our constitutional stability and legal certainty will be determined. By voting in favour of the ‘Do No Harm’ amendment Peers have the opportunity to put the protection of the public’s health clearly at the heart of this and all future good governments. The ‘Do No Harm’ amendment would also be a fitting way to celebrate the NHS in its 70th year. For the statement, please click here. The Sustainable Development Goals (SDGs) aspire to ‘leave no one behind’. These 17 goals are to be achieved by 2030. One of the goals (SDG 3) is dedicated to health i.e. ‘ensure healthy lives and promote wellbeing for all at all ages’. In order to find out how Europe and European countries are doing, some 2,5 years after the adoption of the SDGs, we raise the question – how is Europe progressing towards the health-related Sustainable Development Goals – or even better – how is Europe progressing towards what we might call the Sustainable Health Goals? The vision for health in the EUropean Union: We believe that a Europe where all people are as healthy as they can be throughout their lives is possible. A Europe that promotes well-being for all people of all ages, and where people can live, work and age in sustainable and healthy environments. A Europe that supports timely access to affordable, high quality healthcare for all. Our common asks from the European Commission: The Lisbon Strategy includes a target of adding two healthy life years on average across the EU by 2020 - a target that still needs to be met. We need strong political leadership from the European Commission to achieve this goal. This requires a Commission Vice-President and a Directorate General dedicated to health,to ensure that health protection and promotion is guaranteed across all European Commission portfolios. Strong leadership on health will resonate with European citizens1 and bring the EU closer to them, restoring people’s trust in the EU institutions. The Lisbon Strategy includes a target of adding two healthy life years on average across the EU by 2020 - a target that still needs to be met. We need strong political leadership from the European Commission to achieve this goal. This requires a Commission Vice-President and a Directorate General dedicated to health, to ensure that health protection and promotion is guaranteed across all European Commission portfolios. Strong leadership on health will resonate with European citizens1 and bring the EU closer to them, restoring people’s trust in the EU institutions. A short overview of the results of the EUPHA members’ questionnaire of October 2016 are now available on this website. Members of the European Public Health Association (EUPHA) were asked what they believe the major public health threats in Europe in the next decade will be. They were invited to identify the main public health issues that, in their opinion, could pose a threat to children and young persons (0-19 years), adults (20-60 years), and the elderly (60+ years). This allowed EUPHA to gain a better insight into future public health issues allowing us to advocate for a more effective and well-founded (re)distribution of resources for primary and secondary prevention. The results also clearly emphasize the importance of a European approach to public health, as many – if not all – of the listed threats can be targeted through supranational policy measures, exchange of good practices and sharing of knowledge of evidence-informed interventions. On 16 April 2018 the EUPHA president, Natasha Azzopardi Muscat, presented a statement at the high-level meeting of the World Health Organisation European Region ‘Health Systems Respond to NCDS: Experience of the European Region’, in Sitges Spain. At the plenary session ‘towards people-centred integrated services’ she talked about how we implement strategies to accelerate making health services more people centred and which challenges need to be overcome. Read her speech here. First, BAT makes no attempt to respond to the specific concerns that led to the US judgement, relating to misleading the public. It seems that we are to believe that, even if the tobacco industry sought to undermine the evidence on smoking-related harm and the addictive nature of nicotine in the USA, it did not do so in Europe. Second, despite seeking recourse when possible to international trade agreements as it seeks to circumvent national laws on tobacco control, it relies on the territorial limitations of American jurisprudence to reject our request. In both cases, our members can judge these arguments for themselves. Our view is that they provide more evidence on why, as set out in Article 5.3 of the Framework Convention on Tobacco Control, the tobacco industry and those it funds should always be excluded from discussions on any aspect of tobacco control. In 2017 leading tobacco companies were required to tobacco companies publish corrective statement advertisements in the U.S.A. telling the American people the truth about their lethal products and related issues, including the adverse effects of smoking, the addictiveness of smoking and nicotine, lack of health benefits from products marketed as being less harmful than regular cigarettes, the true harms of second hand smoke, and their record in intentionally designing cigarettes to make them more addictive. EUPHA believes that the citizens of Europe are equally entitled to be told these facts. Consequently, we have written to both British American Tobacco and Philip Morris International to ask them to take the same measures in Europe. Our letters are published below. In a paper in The Lancet medical journal, Dr Derek Yach, President of the Philip Morris International Foundation for a Smoke-Free World, expressed a wish to work with others to create a new cadre of tobacco control researchers. EUPHA recognises that, especially for those in countries where funding for health research may be limited, such an invitation from an organisation that will be spending $1 billion over the next 12 years may seem attractive. However, we join with many health organisations, including the World Health Organisation, to declare that we will not engage with or collaborate with the Philip Morris Foundation in any way and call upon all European public health organisations to do the same. Read the full statement here. EUPHA and the EUPHA section on Health workforce research have reacted to the EU public consultation asking for input for the next EU Research and Innovation Programme. EUPHA proposes to develop a research-based vision on health workforce that is able to balance the interests of different Member States as well as the principle of a common market and free movement with the European Union and the national/regional need of a sufficient density of health professionals to provide universal healthcare coverage for all citizens. An integrated theory-driven program on health workforce research in the European research agenda adds value especially in the following areas: health workforce migration, conditions for an open health labour market, the investment in Europe-wide availability of both quantitative and qualitative data, and the coordination of health human resources models. On 22 February 2018, EUPHA submitted its response to the Public consultation on EU funds in the area of investment, research & innovation, SMEs and single market. This consultation on EU funds specifically concerns the area of public health, where EUPHA argues strongly that European funding remains necessary and has added value. EUPHA welcomes the publication of the European Commission’s “Proposal for a Regulation of the European Parliament and of the Council on health technology assessment and amending Directive 2011/24/EU”. Please click here for the statement. Today the European Public Health Association (EUPHA) is publishing its E-collection: ‘Facing the facts: challenges in vaccinating Europe’. This E-collection reflects on challenges in vaccination in the European region and includes a selection of scientific peer-reviewed articles recently published in the European Journal of Public Health. The E-collection is accompanied by an editorial written by the president of the EUPHA section on Infectious diseases control, Dr Aura Timen, and colleagues. During the 5th Annual scientific conference of the European Association of Personalised Medicine (EAPM) in June 2017 in Belfast, Northern Ireland, the EUPHA president, Dr Natasha Azzopardi Muscat, was interviewed on the importance of keeping health at the core of the European agenda. The European Public Health Association (EUPHA), a network of national associations of public health, representing around 20’000 public health professionals, wholeheartedly welcomes the European Commission’s roadmap on vaccine preventable diseases. Vaccination is one of the most powerful and effective public health interventions known. It has saved millions of lives and brought huge benefits to public and individual health. As a direct result, many infections that used to affect the most vulnerable, including children, have disappeared or are extremely rare. Scientific evidence of the beneficial effect of vaccines is overwhelming; there is unequivocal evidence going back decades that vaccines have been one of the major drivers of the decreasing burden of infectious diseases. Yet we in Europe cannot be complacent. Vaccination coverage with MMR (measles, mumps, and rubella) is already too low in several countries in Europe, leading to outbreaks of measles, with cases in children needing hospitalisation or even dying. Everywhere, vaccine hesitancy threatens the achievement of sufficient vaccine coverage to protect populations from infections. Prof. Martin McKee, immediate past president of EUPHA, has reacted in the Austrian newspaper "Der Standard" to plans of the new coalition NOT to implement the general ban on smoking. Austria was, in 2015, one of the last European countries to decide to adopt a general ban on smoking, to be implemented in 2018. With the discussions of coalition partners to set up a new government, this general ban on smoking is back on the discussion table. McKee states: "the evidence on the huge advantages of a general ban on smoking cannot and should not be ignored". "Alcohol consumption, and with it the burden of alcohol-related disease, is higher in Europe than anywhere in the world" write the authors of the latest e-collection from European Journal of Public Health. This fascinating e-collection includes a special introduction and was created as EUPHA's support to its Estonian member, the Estonian Health Promotion Union. During the second half of 2017, Estonia holds the Presidency of the Council of the European Union. Alcohol is a topic high on the agenda of the presidency and this e-collection serves as a robust evidence-base and valuable resource for public health researchers, advocates, and policy makers across Europe. EUPHA supports the statement by European Public Health Alliance - EPHA ‘I Pledge for a future EU Roma Framework which delivers’. The statement to the European Commission on the public consultation on the evaluation of the EU Framework for national Roma integration strategies up to 2020. The Stockholm Declaration on sustaining health and resilient communities is published at the Stockholm 2017 conference. This Declaration was set up by the European Public Health Association and the Swedish Association for Social Medicine and invites other NGOs to fully engage in collaboration across professions to promote sustainable and healthy communities throughout Europe and beyond. Prof. Martin McKee, immediate past president of EUPHA, was one of the co-authors of a comment in The Lancet entitled: "Towards a smoke-free world? Philip Morris International’s new Foundation is not credible". The authors end their comment with a call for action: "Health organisations should continue to press for action and expose the aims and activities of the tobacco industry. Scientists should reject the siren songs of involvement in tobacco industry promotions. And the public should be aware that Big Tobacco remains as it was, the main cause of premature death and disability from the world’s most preventable pandemic." For more information, click here. EUPHA has joined up with EHMA and ASPHER to produce a statement Towards a sustainable workforce in the European region: a framework for action, presented to the Regional Committee Meeting of WHO Europe in week 37, 2017, in Budapest, Hungary. On the 9th of June 2017, the EU’s Scientific Panel for Health is organising its second annual conference on: ‘Health research in a connected and participative society’. The European Public Health Association – EUPHA, EuroHealthNet and the European Public Health Alliance - EPHA, welcome this conference, and especially the priority it will give to participative and collaborative research. However, having read the programme, with its focus on health technology, digital innovation and health care, it risks missing an opportunity to promote research that could bring major benefits to the health of Europe’s citizens. Specifically, we are concerned that there is insufficient attention to public health research. Such research, seeking to develop population-level responses to the growing burden of diseases, and especially of multi-morbidity, can offer innovative means to prevent and protect health by tackling some of the major drivers of the overall burden of disease. Please click here for the full statement. Today, 20 May 2017 – European Obesity Day – EUPHA is proud to present its report on Healthy and Sustainable Diets for European Countries. This report – set up by a working group within the EUPHA section on Food and nutrition – calls for all European states to establish a statutory Sustainable Nutrition Task Force, that considers and includes the wider aspects of food. EUPHA welcomes the Commission’s White Paper on the Future of Europe as an opportunity to reflect on the direction that the European Union might take in the coming years. EUPHA calls upon the EU institutions to ensure that public health and health systems research are given due importance in order to enable European solutions, informed by evidence, to assist policy making in these challenging times. The European Union should urgently come forward with a new target and measures to cut serious road injuries, according to public health and medical experts from across Europe in a letter sent today to the president of the European Commission Jean Claude Juncker. The full letter can be found here and has been coordinated by the European Public Health Alliance in cooperation with the European Transport Safety Council and is co-signed by EUPHA. EUPHA and ȪGPH are actively looking for organisations to support the Vienna Declaration and acknowledge the Ottawa Charter. Please join us! Please send us an email (to office@eupha.org) stating your support and include your logo. We will include this in our list of supporting organisations. Spread the Vienna Declaration: we invite you to distribute the Vienna Declaration within your networks. The European Public Health Association congratulates the WHO Regional Office for Europe on the development of the new Action Plan for Sexual and Reproductive Health - towards achieving the 2030 Agenda for Sustainable Development in Europe – leaving no one behind. The guiding principles of the Action plan are in line with our four pillars: research, policy, practice, training and education. We cannot invest in future generations while ignoring the sexual and reproductive health needs of all people – young and old, rich and poor. Including sexual and reproductive health in the Agenda 2030 confirms the importance of this aspect of health. Public health activities in the European Region must create the conditions under which people can improve their health and wellbeing, as set out in this Action Plan. EUPHA supports the vision, goals and objectives of the Action Plan, which are consistent with a public health approach to the entire spectrum of health and wellbeing and not only sexual and reproductive health. ensure broad cross-sectoral collaboration in its implementation. EUPHA offers its full support for making the vision of the Action Plan a reality. EUPHA wishes to express its solidarity with public health practitioners and researchers in the United Kingdom following the outcome on the Brexit referendum. EUPHA calls upon political leaders to ensure that during ensuing negotiations, safeguarding the health of citizens in the UK and in the rest of the European Union is considered as a priority. The Mexico Declaration is a historic circulatory health declaration that was signed by leading global organisations at the World Congress of Cardiology & Cardiovascular Health 2016. The Declaration, reproduced in full below, is a firm commitment to tackle cardiovascular disease (CVD), the world’s leading cause of premature death, recognizing that global action, national plans and a common vision are needed to achieve this. EUPHA has co-signed a letter to the editor of the Times newspaper in the UK on 9 June 2016, adding further support to the Mexico Declaration. You can read the letter by clicking here. May 31 is World No Tobacco Day, and EUPHA and EUPHAnxt would like you to contribute to build a smoke-free world. suggest him/her to stop smoking. Spread the voice, we need your help! You can check out the WHO website here. 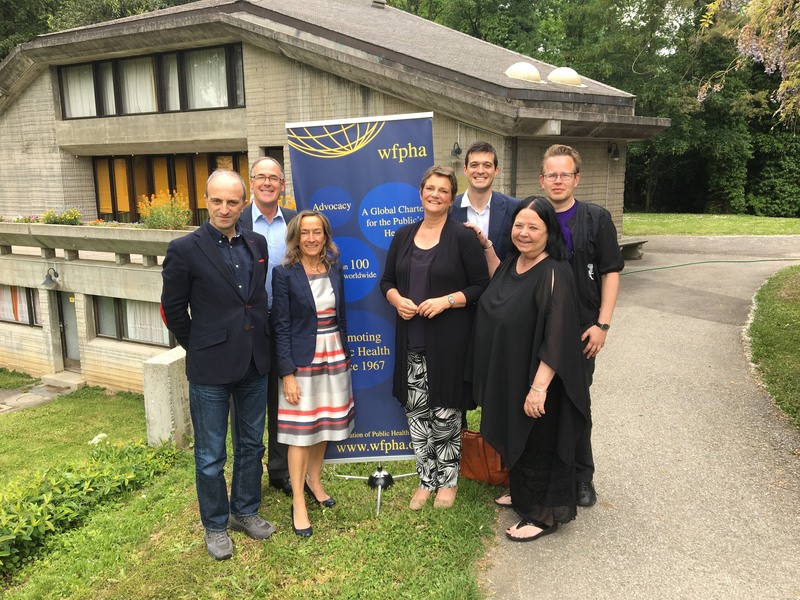 EUPHA joined the WFPHA general assembly in Geneva on 22 May 2016. EUPHA enthusiastically welcomes the decision by the United Kingdom government to implement a tax on sugar sweetened beverages, adding to the welcome already expressed by our member organisation, the UK Faculty of Public Health. EUPHA calls upon European governments to follow the approach taken by the UK government, as part of a comprehensive strategy against obesity and encourages the European public health community to learn from those activists in Berkeley who were so successful in standing up to powerful vested interests. Read the Press Release here. We encourage our member associations to distribute the press release in their own countries. The tobacco industry manufactures a product that will kill half of those who use it in the way that is intended. Many institutional investors continue to invest in the tobacco industry. EUPHA believes that such engagement with the tobacco industry is futile. We see no evidence that the industry has changed its ways. Following the success of Tobacco Free Portfolios in Australia, we call upon institutional investors in Europe to follow the lead of a growing number of investors in Australia and publically disinvest in this disreputable and ultimately doomed industry. EUPHA has joined the Steering Group of the European Health Information Initiative (EHII). EHII is a multi-stakeholder WHO network aimed at creating an integrated, harmonized health information system for the entire European Region by fostering international cooperation. EUPHA will be represented by the President of the EUPHA Section on Public Health Monitoring and Reporting, Dr Nicole Rosenkötter from the NRW Centre for Health in Germany. Other members of the EHII Steering Group are Member States, WHO-collaborating centres, multi-country information networks. In addition, the European Commission and OECD participate in the Steering Group. The Steering Group is chaired by Annemiek van Bolhuis, National Institute for Public Health and the Environment, The Netherlands. Click here for more information about EHII. The letter signed by Martin McKee, President EUPHA, and more than one hundred European researchers on the Data Protection Regulation was published in The Times on Thursday 19 November. The letter is behind a pay wall, but it is also published in full here. We invite our members to share the letter with their relevant ministries and government institutions. Ask them to urge the European institutions to ensure that the Regulation strikes an appropriate balance that protects the interests of individuals while enabling research that benefits us all. The initiative has reached nearly 6,000 signatories on the public petition. EUPHA welcomes the call by Dr Zsuzsanna Jakab, WHO Regional Director for Europe, for Europe to ensure that refugees can find safe, hospitable environments and access to high quality health care , free from discrimination. We again call upon the governments of Europe to make this a priority at this challenging time, working individually and together to find an enduring solution to the crisis that has affected so many vulnerable people. The European Public Health Association (EUPHA) has previously noted its concerns about the secrecy surrounding negotiations on the Transatlantic Trade and Investment Partnership (TTIP). This week, following a freedom of information request by the Corporate Europe Observatory, the European Commission published an almost completely redacted set of documents relating to its discussions with global tobacco companies. The story is reported in detail in the UK newspaper The Independent. The European Commission argues that this redaction is necessary to protect its negotiating position. While there may be a case for withholding internal Commission documents, this argument is simply not credible in relation to correspondence with the tobacco industry. EUPHA regards the Commission’s actions as unacceptable and calls for the full release of this correspondence as soon as possible. EUPHA supported a petition of the French Public Health Association (SFSP) urging the French government to explicitly include health in the final negotiations and commitments of the Conference on Climate Change (COP21) which will be held in Paris from 30 November to 11 December 2015. Health professionals should take an active role in preparing society for these challenges as well as helping to tackle the consequences. The official COP21 agenda must therefore increase the focus on health challenges and increase the involvement of health professionals. The petition of the SFSP can be downloaded here. Health colleagues in other countries are encouraged to lobby with their governments to include health consequences in their preparations for the Summit later this year. Resolving the crisis requires a coordinated process across governments, addressing both pull factors in migration, for example by investing in training for those without skills in the existing European population, thereby reducing the need for migration, but also the push factors, working with renewed vigour to achieve peace in war-torn countries. Read the full article and Newsletter here. EUPHA welcomes the work that OECD has done to assemble the evidence base for action to tackle the severe health consequences of alcohol. In particular it strongly endorses the call for a combination of policies addressing both individual heavy drinkers and the overall level of consumption in the population. EUPHA is calling upon European Governments to demonstrate leadership in committing to meaningful sustainable development aid since this is the only manner in which desperate mass migration can be addressed in the medium to long term. EUPHA joins large-number of European-based health organisations to congratulate WHO EURO on developing a nutrient profile model for the purpose of restricting food marketing to children. EUPHA calls upon the JURI Committee to make major changes to the proposed directive along the lines proposed by the Corporate Europe Observatory, Medicines in Europe Forum, and the International Society of Drug Bulletins. The UK Faculty of Public Health (FPH) and the European Public Health Association (EUPHA) are calling on the EU to oppose the Transatlantic Trade and Investment Partnership (TTIP), a proposed free trade agreement between the European Union and United States. Professor Martin McKee, President of EUPHA, said: "TTIP will take the power to make decisions away from democratically elected politicians and put it in the hands of a mechanism that is beyond public scrutiny and outside the UK court system. EUPHA and FPH are calling on the European Union to put health before profit and reject TTIP. We need healthy communities for economic growth." On 2 December 2014, EUPHA published a statement on plain packaging for cigarettes. EUPHA believes that the case for introducing standardised packaging for cigarettes is now overwhelming and calls on Europe’s governments to implement it without delay as part of their tobacco control programmes. EUPHA calls on all European citizens to recognize the scale of the crisis on their doorstep and for their governments to act urgently in ways that reduce the massive toll of suffering. Brussels, 2 October 2014 - We are writing to support Member States who have already expressed their concerns  on the decision of European Commission President Elect Jean-Claude Juncker to move the competence for medicinal products and health technologies from the Commissioner in charge of Health to the Commissioner in charge of Internal Market and Industry within the new Commission. We would like to ask for your full support to have that decision reversed.